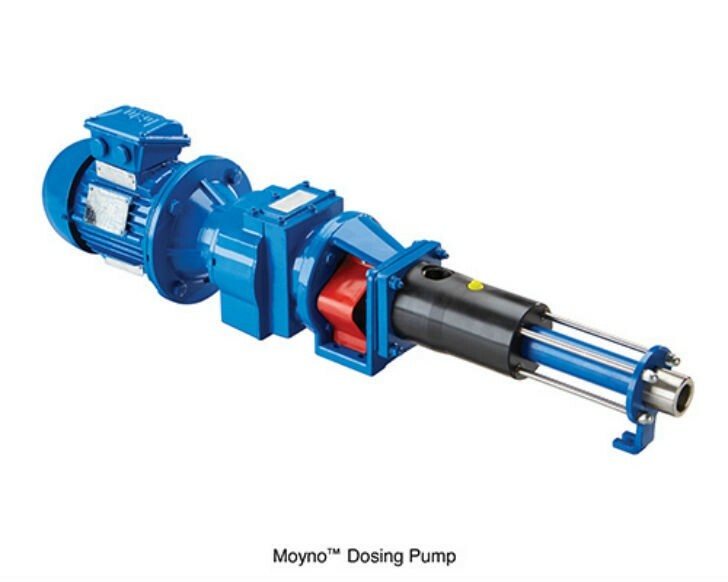 A new range of dosing pumps launched by Moyno offers an efficient, reliable and low maintenance solution for applications where low flow, accurate dosing is required. The new dosing pump provides a smooth pumping action with no pulsation and very low shear. The pump is ideal for either intermittent or continuous dosing duties in high pressure, low flow applications, and represents a cost-effective and reliable alternative to the more expensive gear pumps traditionally used for these types of duties. The new dosing pump offers many advantages, not least of which is the option to transfer low flows at high pressure (1,044 psi/72 bar).With no valve components (reducing the number of wearing parts), blockages are eliminated and the working pump life is extended. Stators are available in a variety of different materials, and their flexible and resilient operating characteristics enable the pump to handle a wide variety of applications, and again, increase the pump’s resistance to wear. When maintenance is required, it can be completed without the need for any specialist skills, thereby maximizing uptime. Manufactured to ISO 9001:2008 quality assurance standards, the modular design of the new dosing pump allows the four models in the range to cover performance requirements from 0.53 US GPH (2 liters per hour) and 1,044 psi (72 bar pressure), up to 330 US GPH (1,250 liters per hour) and 174 psi (12 bar pressure). All the pump components, with the exception of the body, coupling rod and suction chamber are supplied in stainless steel as standard, and have the option for internal pump components to be supplied in Hastelloy, which allows the pumps to be used in severe chemical environments. Other optional features include a range of fixed or variable speed drives with mechanical variable speed or frequency inverter.